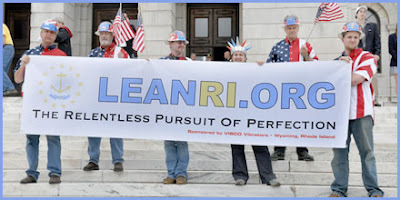 A group of people representing LeanRI.org gathered on the steps of the Rhode Island Statehouse to support the Gaspee Tea Party. The Gaspee Tea Party was organized to protest excessive taxes and excessive government spending. LeanRI believes that it is though lean principles that these taxes and excessive spending can be reigned in. Lean principles teaches us that through the elimination of waste we can decrease expense. If government can adopt lean principles, eliminate waste, they can then provide better services with the current resources and we can all benefit. See the Tea Party here.